My teaching activities in JSGS focus on two fields: Aboriginal Public Policy and Scientific and Technological Innovation. In the Aboriginal Public policy course, I blend an understanding of historical processes and contemporary realities, emphasizing the steadily increasing role of Aboriginal governments and hence, Aboriginal policy making. This issue is, to my mind, pivotal to Canada’s long-term viability and essential for the completion of Confederation. The challenges are very real but so are the achievements, particularly by Aboriginal leaders and governments. The course also endeavors to identify the appropriate means of working with Indigenous communities and learning from their political and administrative processes. In the Science and Technology course, I focus on issues of Circumpolar Innovation, looking at how governments and service providers can capitalize on technological advances to improve the quality of life for people in Northern, Aboriginal and remote/small communities. Most of the benefits of national commitments to innovation currently flow to metropolitan areas, increasing the economic and social advantages that they have over smaller and more remote centres. As governments come to appreciate the potential of the technological transformation – from the Internet and satellite communications to alternate energy sources and tele-medicine – they will need an appropriate policy framework to sustain and support communities facing many social and economic forces of decline. Done properly, scientific and technological innovation may be able to address some of the fundamental issues facing isolated communities across the sub-Arctic and Arctic. The Policy Innovation Research Suite (PIRS) is a key element in my CRC research program, developed with the aid of generous support from the Canada Foundation for Innovation. 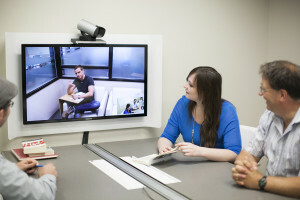 PIRS is a multi-functional technology suite, designed with the assistance of graduate students, to marry computer and video-conferencing capabilities with the learning styles of today’s young adults. We will be conducting research on the PIRS over the coming years, to determine if research and academic engagement can be effectively facilitated by high end video conferencing (designed for different sized groups and purposes), collaborative working spaces and an open, accessible working environment. At root, PIRS reflects my personal belief that public policy development should be an open, engaged and flexible process. Conceptually, the availability of interactive and social media should facilitate these processes and should encourage more inclusive approaches to policy design and implementation. 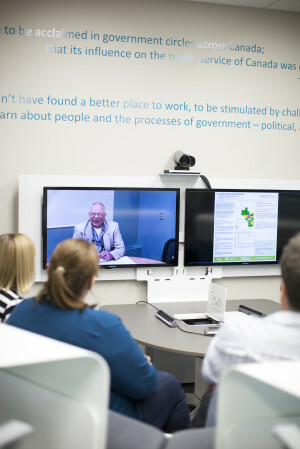 PIRS includes a two person interview room, a 12 seat theatre, a ten seat collaborative table (with video conferencing), an eight seat collaborative table (with computer support) and a 6 seat high quality video-conferencing unit. PIRS is located in the Diefenbaker Building at the University of Saskatchewan, adjoining the River Room (which offers spill over social space with a lovely view of Saskatoon).